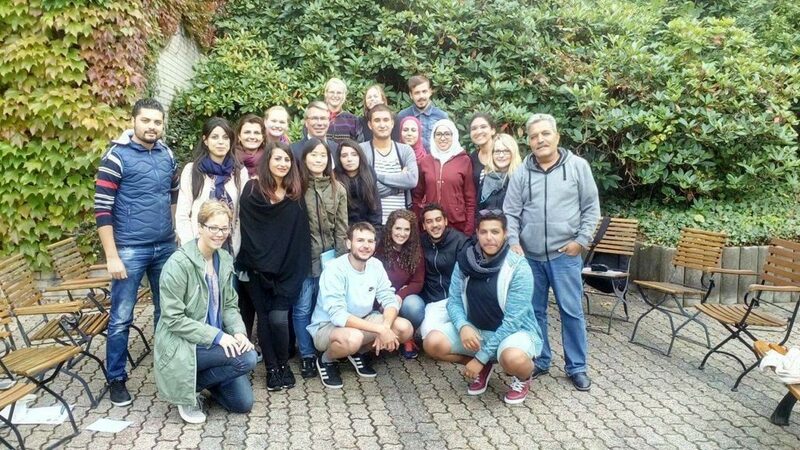 Youth exchanges are all about the experience and that’s what we exactly got: Two weeks of endless learning experiences with ATACJL and GESW in two beautiful different countries. The fun we had was beyond our expectations and the knowledge we’ve got after blending with our Germans friends is a treasure that we will always protect. During the first week in Tunisia, we did some workshop and debates that pushed the participants from both countries to know more, not only about each other; but about the country as well. Some early morning language animation sessions were done by Mondher Kebiri, one of the participants. He gave us the chance to learn some basic Arabic and German sentences to make better our communication with 45 daily minutes of fun, full on energy & laughter. The debates, on the other hand, were all about hosting different local Tunisian associations: Karama, Red Crescent, Amnesty, and Sawty. Most importantly we met with the 2015 Nobel Peace prize winner, the National Commission for Human Rights in Tunisia, specifically with its representative Mr Jamel Msallem. These associations were kind enough to represent their affiliates and share with us their experiences and encourage us to join them. In order to give our German friends a clear idea about our political system, and since we have an upcoming election; ”ISIE” The Independent High Authority for Elections which is responsible for organizing and supervising elections nationally in Tunisia, joined our program to explain how it functions and its important role in the country, especially given the trust issues that we’re going through in Tunisia. Among all these debates, ATACJL invited Mr Elwaslety who is the youngest Imam in Sousse to answer our participants’ questions about Islam, especially since EID was at the end of the week. And as we expected, we saw a lot of participation and curiosity that created a very nice and friendly environment for us to ask and for the imam to answer. Touring was a little hard since the weather was hot but we managed to visit Kairaouan where we visited the Great Mosque of Kairouan; then we headed to Sidi Essahbi. The next destination was Monastir. Moreover, the capital Tunis was our target because we had the chance to visit the Arab Human Rights Institute and meet the president Mr Abd elBasit and enjoy an early morning hour of questions and answers about the activities of this amazing institute and its future plans. The second destination was the Tunisian Parliament where we enjoyed our delicious lunch with the company of Mrs Chahira. 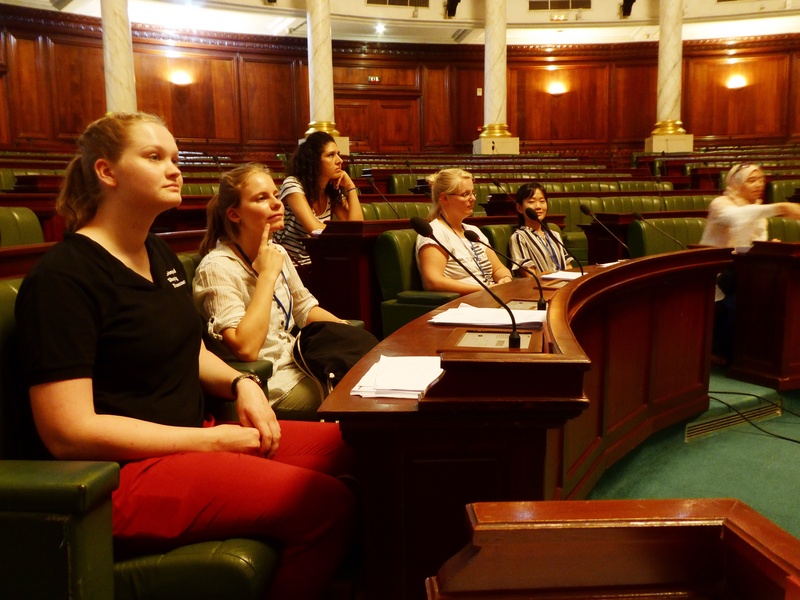 For us Tunisian it was a breath-taking moment to actually enter a place where a lot of important decisions were made. The next visit was the beautiful well known SidiBousaid and the medina. We also toured in Sousse el medina and afterwards we visited the Ribat castle. 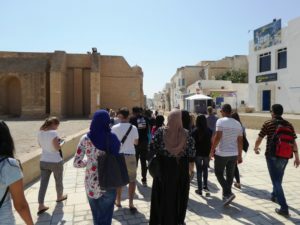 The best days in the program for us Tunisian participants were when we had the city game and the opportunity to guest our German friends in our city, Hammam Sousse. The second day was the Eid where we hosted them in our houses and showed them our traditions and daily habits. This day I’m sure will be memorable for the rest of our lives. The next day we headed to Germany. Everything in Germany was giving us a total different feeling, feelings of excitement and joy but at the same time the fear of making a mistake that might offend anyone, manners are everything! But we were lucky enough to have our German friends by our side to guide us especially when we were touring the cities. They were kindly translating for us and giving us advice. In Germany, we stayed at GESW’s amazing facilities where we continued our 2nd week of workshops about democracy in Tunisia and Germany as well as Geo-caching with Mr Lars Schulz and the morning language animation. We were honored as well to meet Mr Christian Dahm; a member of the North Rhine-Westphalia parliament who did not hesitate to answer our questions and help us to know more about the political system in Germany. With the time, our little group became a strong bonded-family. The adventure side of the exchange started when we visited the cities. 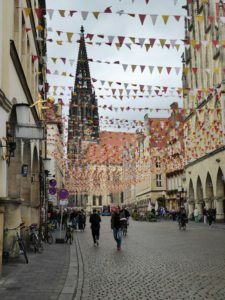 Bielefeld, the calm beautiful city and with the lovely Karina and Sohee as our city guides who showed us the old high school and the big castle. We had an amazing trip. 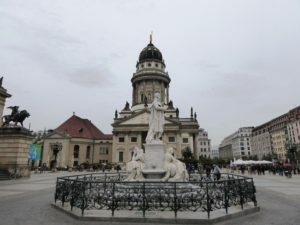 Then it was time for the amazing Munster, the delicious food was pure perfection, the city with beautiful churches and streets captivated us with its historical facts that Navina told us in details. We got the chance to enter some of these churches and learn about their history, especially St. Lamberti. And some of our German friends gave us basic information about Christianity. 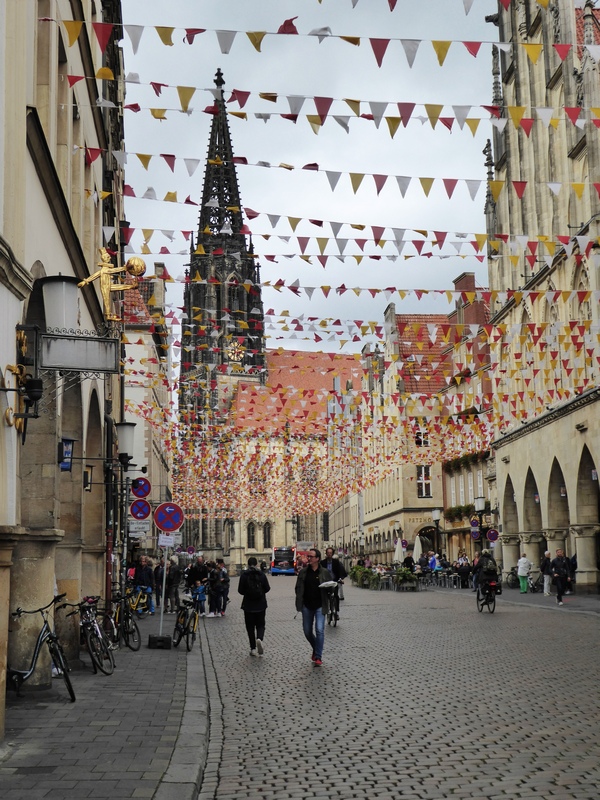 In Bielefeld and Munster, the streets themselves were mesmerizing that we couldn’t help but take pictures. In Berlin too, that feeling of excitement continued despite being tired because of the long trip after 12 days of non-stop workshops. We got the maps and started visiting monuments like Berlin’s Wall and Kaiser Wilhelm Memorial Church. 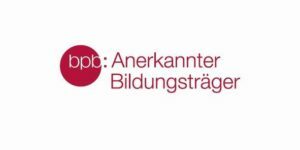 We cannot forget that we enjoyed the visit to the German parliament. Also and we noticed the difference between the 2 countries political systems. The next day, we said our goodbyes and went in our separate ways hoping to meet again. This exchange program wasn’t just for meeting people from all walks of life for educational purposes, but also making new friendships that might last forever. 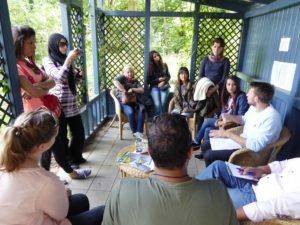 Hammam Sousse – Vlotho 2017 youth exchange was not just an opportunity for a non-formal education but a place where two different countries and bi-national groups come together as one with the help of two responsibles Mr Chokri Jegham and Mrs Navina Engelage. For that, we, the Tunisian participants cannot recommend this experience enough. Words won’t do it justice, for that we only say that we hope everyone who is interested in participating in such a youth exchange to just go for it with all the energy he/she got and enjoy to the fullest this amazing experience, just be open-minded and ready for some culture shock! Eine gute Adresse für Europa!